Social media is a wonderful tool for information. It allows people to be connected like never before, but the volume of information can be overwhelming for many. Thankfully programs like Hootsuite and TweetDeck have been created to allow us to filter the information we receive, but they can be intimidating when users are confronted with massive walls of text as the programs sort out the information. 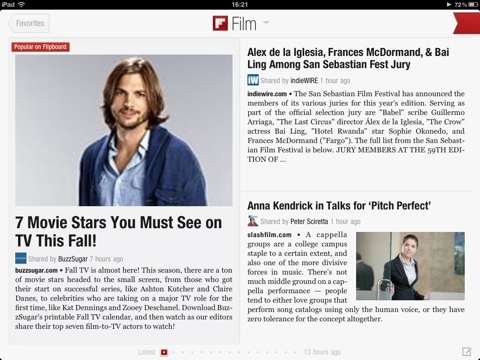 News aggregation websites and programs can lead to similar circumstances, but iPad users can find some relief in the magazine-inspired Flipboard app. The app presents information from the user’s social media networks in a graphical format that gives some relief from text heavy aggregators. Stories are divided up into various sub-sections that can be flipped through by swiping the screen to the next “page.” The app also supports several partnered news organizations, rss feeds, and pre-aggregated sections that users can load into their favorites section for easy viewing. The app currently supports Facebook, Twitter, Google Reader, LinkedIn, Flickr, and Instagram, but only one profile from each can be loaded. This can be a drawback for anyone that has multiple accounts in Twitter or other multi-account services. 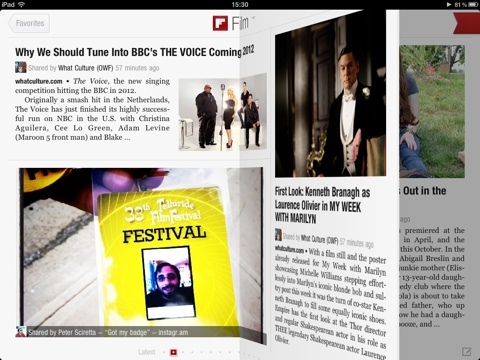 Overall the experience of reading social media through Flipbook is enjoyable. The space created by the visually-centered interface makes it easier to skim through the links and stories without becoming overloaded. The app’s support of a sharing feature through Twitter allows for quick retweets without having to use a different app. This can make it easy for users to share interesting stories that may not have been shared through Twitter originally. The app also allows for users to write original Tweets if they want to update without tweeting. The app does not currently support Google+, which is a major drawback and can be a problem for anyone that has already moved over to that platform. The options available in the program are also limited. 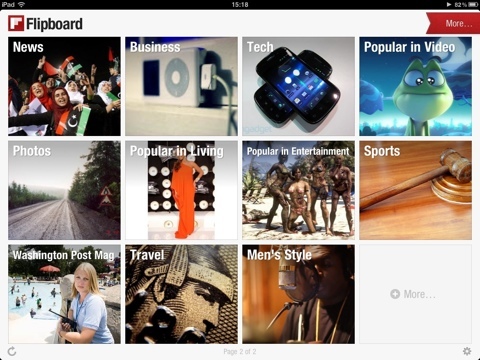 It supports Instapaper and Read It Later as read later options, but Evernote users will have to look elsewhere. The program also does not allow users to change how the data is sorted. The sections are sorted by popularity or chronologically with popular articles sprinkled into the timeline. While Flipboard puts red highlights stating the articles are “Popular on Flipboard” it would be nice to have the option to remove these from the stream of chronological information. Overall, Flipboard is a slick and pleasant alternative to traditional news aggregators for iPad users, but it does lack some options that will hopefully be addressed in the future. It would be nice to see some Google+ and multi-account support in addition to more user options.